A few weeks ago, it was announced that there will be a live DVD/Blu-Ray from the current Black Sabbath 13 tour. This should come as NO SURPRISE to anyone, honestly. What I am a little surprised about is that it is from the Australian tour earlier in the year. I would have thought they would have recorded a few shows, and picked from what is the best available. I know some of the gigs from the US tour got some rave reviews. But anyway, that’s an opinion. Let’s talk about what they announced earlier today. It would also appear, at least initially that the Deluxe Box will only be available from the official Sabbath site, and the record label (who the official site links through to anyways). If you read through the official press release, it says that the DVD will come packaged in an “Amaray Box”. This isn’t anything “fancy”, it’s just a plain DVD case. Amaray is the name of a company that manufactures DVD/Blu-Ray cases, and the “Amaray Box” (or case) has been around for a VERY long time. In fact, if you have any DVD’s at your house, you probably already have a ton of them. It’s also known as a “keep case“. I’m guessing the DVD with the CD in it will just be a regular DVD case with one of those “pages” where a second disc is held, but that last part is personal speculation. Likewise, the Blu-Ray version with the CD will be pretty much the same I’d wager. A standard Blu-Ray case with an extra “page” for the additional audio CD. So Unless you’re going for the Deluxe Box, you’re going to get a DVD or a Blu-Ray case. How many discs are in there will be determined by what version you buy specifically. Blu-Ray of concert. Said Blu-Ray will include “exclusive” bonus material extras. 2 DVD’s. The DVD’s are a content mirror of the Blu-Ray, so you’re not getting even MORE, you’re getting the same video material on more than one format. The big draw for me here would be the additional content on the Blu-Ray. I initially wondered why they had both the DVD & Blu-Ray in there with the same content, but then it occurred to me that they only have to make one copy of the Deluxe Box, and don’t need two versions, one for each disc format. The cost to them to put the extra in there is minimal, I’m sure. This is where some people will probably have a beef with the various packagings. In particular the audio CD. Mostly because it is not the whole show. You cannot (as far as I can tell) order just the audio CD on its own. It is only available as a pack-in with the other formats (unless you specifically buy one that doesn’t have it). The full concert would have needed two CDs, and there is just one here, so the audio CD is rather crippled insofar as what is available on that format. Here, check the various track listings.. Here are links for you to buy these things. A quick note. If you pre-order these from the Amazon.com links ON MY SITE, I will get a small cut of the sale. That will go towards helping the upkeep of this place. Obviously, if you’re buying the Deluxe, you have to go through the official site, but if you are buying any other format besides the box, please use the links on this page. It helps out this site. Thanks. It would appear that the Canadian ordering links also have some packages available that let you buy a T-Shirt with whatever format it is you are ordering. I cannot find this shirt option available for the US or “Rest of World” links. Strange. One other remark about Amazon pre-orders. Their prices when you pre-order tend to be much higher than what they are when something actually ships. The prices you see now (as I write this on Oct 4th) will almost certainly be lower (especially for the Blu-Ray w/CD) than that when the item actually ships. So basically, if you want the full gig on DVD & Blu-Ray you have to buy the Deluxe Box set. The regular DVD/Blu-Ray as well as the DVD/Blu-Ray with the audio CD will not have the entire concert on them. That is DEFINITELY NOT for reasons of space, it’s a marketing decision to hold back the whole concert for the deluxe box. This also should not be a surprise based on the way “13” was marketed. This even to me comes down to the “replica autographed set list sheet” from the Deluxe Box here. It mimics to me the replica autographed lyric sheets from 13’s deluxe box. One lesson possibly learned this time around though is to put the “full track listing” in the Deluxe Box. I know it pissed off a lot of people who bought the 13 Deluxe Box that you didn’t get ALL the tracks in that. You still had to go buy the Best Buy edition to get an additional studio track. It would appear that if you buy the Deluxe Box, you’ll get all the available tracks for this release. Of course, they could always surprise us and announce a “Best Buy Limited Edition” with addtl info. Man, I hope not, for two reasons. 1) That kind of thing is scummy, and 2) It’s Best Buy. Ugh. Sarcasm aside, I really hope they don’t do that here. This package comes from the concerts recorded on Apr 29 & May 1 in Melbourne, Australia. I wonder if those who were at the concerts, or those who have bootlegs will be able to pick out which show which track is from. As I’ve said all along, a live DVD/CD/whatever from this tour was inevitable. The only thing I would have hoped was that the release would have included at least some of (if not all) of the four still unreleased studio tracks from the 13 sessions (Cry All Night, Isolated Man, Season of the Dead, & Hanging By a Thread). But unless they’re just unannounced (not likely), they’re not going to be here. SO, somewhere down the line these tracks will be released on SOMETHING, and we’ll have the chance to buy them again (A “13 Full Edition” in a year or something? Who knows). There’s also the issue of Digital releases. iTunes and whatnot. These days concerts are also released digitally, and while I haven’t heard anything about this package being made available on digital, I wouldn’t be too surprised if an iTunes purchase of the Blu-Ray/DVD material shows up too. But I admit right now that is personal speculation. To sum this up, I think it’s a worthy release, despite all the fiddling with track listings. To me, the target is Blu-Ray. In this day and age, plain DVDs are a dinosaur. Blu-Ray. High Def. Just wish the regular Blu-Ray has all the content that the Deluxe Edition Blu-Ray has. Below are a couple of video trailers for this box, one produced for this news is listed first. Also is the formal press release from the band about this. 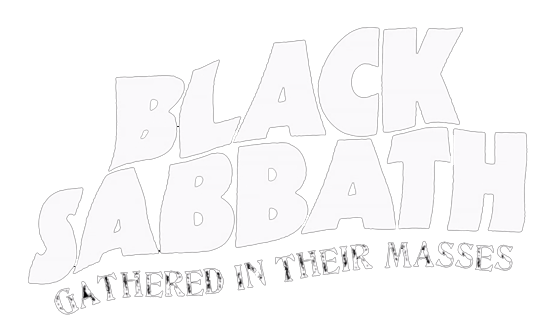 BLACK SABBATH’s triumphant 2013 tour–which kicked off earlier this year in Australia–can now be seen by fans around the world via the forthcoming “Black Sabbath: Live…Gathered in Their Masses” (Vertigo/Republic). 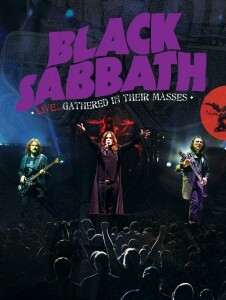 Preorders for “Black Sabbath: Live…Gathered in Their Masses” are available now at www.blacksabbath.com and www.amazon.com. A preview of “Black Sabbath: Live…Gathered in Their Masses”–featuring the first-ever live performances of songs from the band’s 2013 critically acclaimed 13 album, along with BLACK SABBATH classics–can be seen at www.blacksabbath.com. 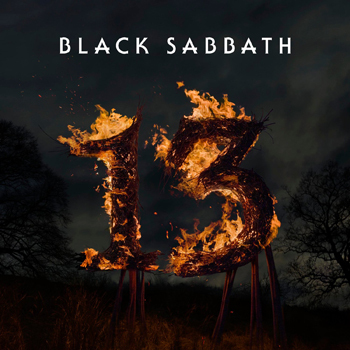 “Black Sabbath: Live…Gathered in Their Masses” was recorded April 29 and May 1, 2013 in Melbourne, Australia when the band–OZZY OSBOURNE (vocals), TONY IOMMI (guitar) and GEEZER BUTLER (bass)–kicked off their world tour in support of their 13album, which entered the charts at #1 in 13 countries (including their first #1 in the U.S.). Meanwhile, BLACK SABBATH will head to South America and Mexico inOctober for a headlining stadium our (where they’re expected to play to more than 300,000 fans) and then onto Europe in November andDecember. I’m wondering if the other guitar pick is supposed a Geezer Butler one. 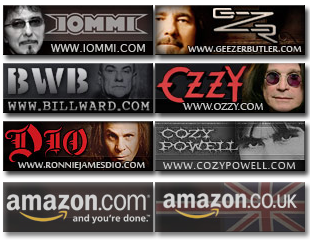 I see the Tony Iommi one but if the other one is supposed to be Geezer’s; I might need to pick it up. Does Geezer use a pick? Geezer occaisionally uses a pick. Depends on the song. That is news to me as I have never noticed Geezer using a pick at all. I am not saying he doesn’t or hasn’t, but I can’t say I have ever witnessed that anywhere. He might not use one, but he definitely has tossed handfuls of them out at the end of shows. I snagged one at the 2005 Ozzfest tour, I believe. Thanks guys, but no thanks. If the entire show would’ve been included on CD I would’ve picked it up, but with half the show chopped off it’s a waste of money to buy the CD (I for one don’t have the time to watch DVD’s to enjoy the show that way). Ë unha puta vergoña que Bill Ward non este nesta xira nin nen este disco en directo! I have a bootleg video from the Australia shows and I must say I am surprised that they found suitable material. Really, I love Sabbath, but this just isn’t the Sabbath I grew up with. Ozzy had serious problems to sing in tune during some songs of these shows, especially in “Loner” – which was a pain to listen to. I once compared a song from the official “Reunion” album from 1998 (recorded live in Birmingham in 1997) to a bootleg of the same show and found that about 50% of Ozzy’s singing was completely different – definitely re-done in the studio. They did the same to the live bonus track of the Spotify edition of “13” (also recorded in one of the Australian gigs this year), and I am sure they’ll do the same to this new release. Joe, as always, thanks a lot for your research! Totally agree. I have Melbourne boot and Ozzy is cringe-worthy especially on the new ones. I dunno. Under The Sun, I was looking forward to that one. But apparently that’s only on the most expensive version. Let’s see which tracks will appear on the iTunes version. In the Reunion live in Birmingham they recorded ALL the ozzy vocals in the studio and sell it like it was “live” for the suprise of the people that was there the two days and saw (and heard) something very different. I’m sure we’ll see a flawless ozzy in ‘Gathered in Their Masses’ while the ones that were at the show and those who get the bootleg knows how it really was. It’s “fun” to hear Ozzy claims Bill was out of shape to play drums in the tour when he’s doing a more than mediocre singing, maybe someone should give him a mirror. I agree with Pepino! I love the band , but Ozzy was way outta key on a lot of songs & has to use a teleprompter to sing the songs because he can’t remember the lyrics, but yet turns around & says bill was too fat to play & had to have sticky notes on his kit to let him know where to out certain things in. What kind crap is that? I remember Sabbath at Live Aid in 1985 & Bill had those notes on his kit. Didn’t seem to bother Ozzy or anyone then! Come on Ozzy, Tony, Geezer, cut the crap. You 4 created and pioneered the best Heavy Metal music and back then had 1 manager not one for each person. If you all are mates like you all say, then how about start behaving like it?? We the fans made you guys & vise versa, but since it was our dedication, love and what have you for the band, we the fans deserve to have the original (ALL 4) members of the band ! Without all this crap your dealing here. Remember , if it wasn’t for US , where would you be?? We deserve the best, now how about we start getting it??? Thank you. Ozzy has been using a teleprompter to remember the lyrics for such a long time. Even during the seventies he used to forget the lyrics… one of the reasons the record company had alwasys been reluctant to release a live album. I listened to Iommi, Ward and Butler mentioning this many times…. I seriously doubt that’s the case. I saw the show in Irvine and he was struggling vocally due to a cold or hoarseness. If he was using piped in vocals in Birmingham, he surely would have done it at this show. I give him an A+ for trying his best to give us a good show, even though his voice wasn’t up to par. I was in Paris show the last 2 of december, and it was Ozzy’s real live voice, not a studio track behind the stage. Yes, I am surprised as to the early filming of a concert. Usually an artist waits for the machine to become a bit more oiled so to speak, before any filming or recording. But having said that, with Iommi’s health & Ozzy’s vocal ‘issues’ at times, maybe they decided to get it done early, just in case something unexpected rears it’s ugly head! Regarding the dvd release, it is disappointing that ‘Under The Sun’ isn’t in the set list, on either night & is only available as an extra. This track was certainly a highlight at the Brisbane gig. Also ‘Electric Funeral’, maybe I will have to buy the deluxe release to get these tracks? Or maybe not, depending on the quality of the performance of course. Hey, Joe!, the standard blu-ray edition is listed with all the 20 chapters/songs on amazon.com…..
Well, i’ll just wait for the release and i won’t pre-order anything untill i know exactly what’s the content of the standard or deluxe blu-ray editions…. IMO, the deluxe edition is not worth the money if the blu-ray content is the same that the standard blu-ray edition. I’m aware of that. It appears to be an error, as far as I can tell. I’ve already made band management aware of that earlier on Saturday. It is being looked into. I stand by my statement. Same thing with 13- I saw that the Best Buy version included Naivete In Black, and that’s where I ended up buying it. “Naivete In Black”? If you did that on purpose, you are a comedy God. I hope we can enjoy the concert as it is and not with interview-interruptions as on the “Last Supper” VHS, which I don’t like. I think I saw the video only once because of this. So I really looking forward. I was at the May 1st gig where they debuted this and it was pretty ordinary. The band sounded top notch but Oz Was very flat and kind of slurred the words alot. It appears from the teaser that DVD was seriously doctored up in post production. I am okay with that. It was a rough start, but if you listen to most recent stuff, it sounds great. You’re right, the chilean gig was outstanding, Ozzy was in great shape and the rest of the guys, awesome as usual, it really was the best concert of my life, they should’ve recorded the lasts shows…. I was hoping for the other 4 tracks from the 13 recording session as well. A real shame the DVD was not from the show at The Gorge, east of Seattle, because in all the years of seeing Sabbath, that might have been one of the best shows ever….incredibly beautiful setting, absoulutely packed with close to 20,000 rabid fans from all over the world, and the band was clearly in a really good mood and played like there was no tomorrow. Peace and Love to everybody…!!! I don’t really want a box set but the bonus tracks are interesting – is this the first time Under The Sun has been on a live album? It’s a bit rubbish putting Symptom Of The Universe in the setlist when it’s the intro to the drum solo – but I’m a Sabbath fan so I’ve ordered the deluxe thing – thanks for all the info Joe! (you’re helping me throw my money away) Can we blame Sharon again? I am still disappointed that they didn’t play the amazing 2 minute instrumental outro at the end of Under The Sun. It’s one of my favorite Sabbath tunes, and there was no reason not to play it live. Such a shame. Totally agree, but at least they played the song…. which is one of my favourites!!! Just wanted to give Joe a majorly supportive nod for all his hard work in maintaining this site and keeping the details fresh and as accurate as possible. I only wish I could purchase the Deluxe Box set, and still be able to allow him to get a cut of the proceeds from the official Website, which is apparently the only source for it. For now anyway. The Black Sabbath original lineup had little to no promotion or marketing back in the 70’s. Most people forget how brutal the crits were to them back then as well. Based upon that, I am enjoying how the band are using social media for promotion. Good for them that they are releasing material for sale to the fans, as everyone benefits! Thank you Joe for the great website and your tireless work! There is a new video for “Loner” in official website. If this is the version from the new dvd, then whole dvd will be one big lie (Ozzy’s vocal). Please check, it’s unbelievable. It’s not a live show, it’s half studio and half live. I could accept some minor changes but this is too much for me. I’m stuck in the middle on this one. For the longest time now I have been having trouble tying the clearly pronounced and enunciated lyrics on 13, with the stumbling and mumbling he does in press interviews. Then I listen to him speak during the CSI/EoTB interview scene. I’ve asked – who the F was THAT guy? But now comes out this stumbling and mumbling through sooooo much of the Loner lyrics I’m having trouble believing he’s the same vocalist that performed so well on 13. I don’t think it’s a studio/live issue. It’s more like a sober/stoned issue. Stoned – by his own admission – he sounds great on 13. Sober – he’s the what we hear on the live Loner. Without starting a OO/RJD/TM debate, the sound of his wickedly malevolent voice, and the heavy accent, teamed up with those 2 guitarists were/are the PERFECT combination for the type of music they create. I just refuse to admit to myself that it is the “fried” Ozzy I like best. I have no beef with live in the studio. It is what it is. Certainly a fully live set is amazing ( like deep purple). But I don’t know any other bands doing that. What trips my trigger is the absurd packaging. I didn’t pay 100 bucks to see the show, why in the f… Would I pay that for the deluxe Ed just to get the whole show?? Really! The fans get screwed by marketing once again! Sad. Once I have more on this I will share. However, PLEASE do not email me me as this is all the information I have at this time!!! It’s a replica. Obviously printed autographs. Not putting the complete show on the standard edition is such a cheap way to try and screw people off. I like deluxe edtions and limited stuff but in this case I’ll download the film and burn myself a real deluxe edition, hand numbered and all, in only one copy. Since they wish to screw me, I’ll screw them. Blu Ray isn’t out yet. It’s pretty good. Reall good in fact! A good reminder of the shows. No special features was a bit lame however. As I’ll probably buy the Blu, I have to say that with these purchases and having paid to see them in May, I’ll download the “bonus” stuff. The deluxe boxset is a rip off. Why in the hell did they leave off 5 tracks on the CD??? I was very disappointed after watching this dvd. When I compare this dvd with two previous dvds with dio (Heaven and hell – radio city music hall and wacken), “gathered in their masses” is crap. Where is Adam Wakeman ? He credited as additional musician ! I saw the band on the 13 tour in Manchester UK. I was worried Ozzy wouldn’t cut it. I was wrong. Maybe I’m looking back thru rose tinted ears (!?) but he seemed pitch perfect the whole show! In fact it may have been the best show I’ve seen him sing. I dont know if there was any trickery used or anything, but voice wise he was spot on. Physically he looked ropey, sort of limping about when he did leave the mike stand but he has punished himself over the years, no more 5ft high frog jumps for him! Maybe if i heard a recording of the show it might not sound as good? Anyway, it was an awesome show, and of course TI and GB were on tremendous form.